How to do a thing! Hello internets! This a simple tutorial on how to do a thing in 7 easy steps (more or less)! 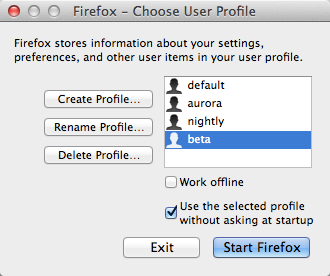 So there are 4 versions of Firefox (Beta, Nightly, Aurora, and Firefox). To run tests on all of them, you need all of them. Only you are not allowed to open more than 1 at a time-that is, unless you have more than 1 profile. So let’s get some more profiles! First download all the things. Three of the browsers are right here and you can side scroll though them! How handy! So download Beta and move it to applications (also re-name it Beta-it has the same icon regular Firefox so it will be useful in telling them apart). 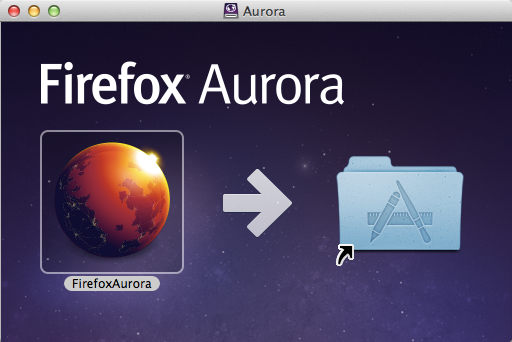 Next I downloaded and installed Aurora and Firefox. Then go to Nightly for the last download and install that. Now you have 4 browsers. But in order to open 2 or more at the same time you will need to make corresponding profiles. I don’t know if that is super clear so let’s just jump into things. 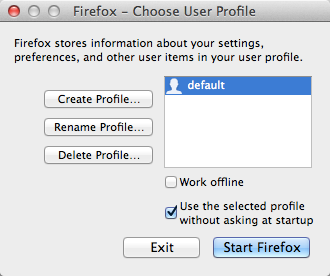 Click the “Create a profile” to the left and make one named “aurora”, “nightly”, “beta”, and then you can use your “default” profile for Firefox. Now when you open a browser it will ask you which profile you’d like to use. Also go claim your badge (or Code: 4wtvvr) for all you’ve accomplished!